We have seen variety of recipes in chicken.This is my Special type of varuval recipe.In this recipe Cinnamon is added in three stages,while Grinding,Seasoning and as Garnishing to enhance its flavour.As mentioned before cooking is an art,colour it with your special ingredients,which is also an aid to improve our health in all aspects. Cinnamon has properties that help those with insulin resistance. It is therefore very popular with Type 2 diabetics who take it to control their blood sugar variations. Research shows that Cinnamon oil is used for the treatment of Tumors, Gastric Cancers and Melanomas. 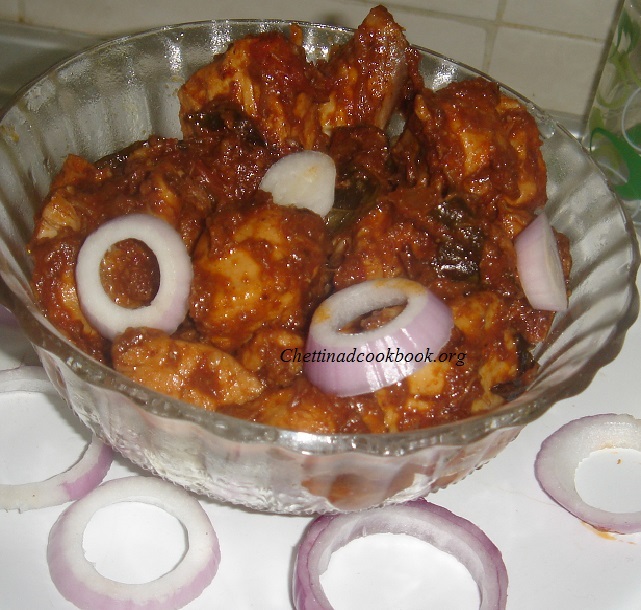 Traditionally chicken is not marinated before cooking in Chettinad chicken.As they used to cook in low fire for a long time in olden days the chicken will observe the salt and hot taste added in,once it gets cooked. These days the chicken we use is tender and gets cooked fast in gas stove. So you can marinate by mixing turmeric powder and salt for 15 to 20 minutes. Heat a heavy pan or skillet on a medium flame and roast golden colour, coriander, cumin and fennel seeds, dry red chillies, cinnamon 1″piece, cloves and coconut for 3-4 minutes. Remove from flame and allow to cool. Grind the mixture into a coarse powder or wet grind paste. Fry rest of the cinnamon,powder it and keep ready. Keep the kadai in the stove. Season the curry with the items given in ‘to season’ in 2 tablespoons of oil. Add the onions and saute with a pinch of salt for 3 minutes. Now add the chicken pieces saute for a while. Add the ground paste Sauté it nicely to mix all the masala over the chicken pieces. You can see lot of water oozes out from the chicken. Reduce the flame and cook for 10 to 15 minutes. (Close and cook for 15 minutes you can add water if you need). Once you find that the chicken pieces are almost cooked increase the flame,so that the gravy becomes thick.Cook for another 5 more minutes.If you want more gravy finally add 1/4 cup of coconut milk. Final step to sprinkle cinnamon powder,add lemon juice and mix well,add coriander leaves on top. That’s it…spicy & aromatic Chettinad Chicken varuval cinnamon flavour is ready. Garnish with Cilantro and curry leaves and serve hot with rice/idly/dosa or hot Rice as you wish to enjoy.